Rough notes from EuroPython 2013, also available in PDF format 437KB. Chairman of the Python Software Foundation, works for Rackspace and OpenStack. Guido managed to build a community. Sense of values. import this. Zen of Python == core part of ethos. Primary teaching language for most universities, finally replacing Java (thank goodness). Raspberry Pi, Upton says ‘Pi’ stands for Python. The prompt as first thing you see when booting a computer is a powerful concept. Today computers primarily used for consumption. Consumption-oriented culture. Young coders, education, is very important. How to use computers to create. Young coders curriculum will be available in new http://www.python.org (python.org built with Django). We all suffer from going with the flow in many cases. The keynote gave some examples of how questioning some established rules revolutionized the industry and how we open our mind a bit. It included interesting examples from the Python and programming community where people tried something new with tremendous success and how they came up with the idea. Describe the problem, leave room for answers. Most things have a design behind them. Gets lost as copied (Chinese whispers). Original design may no longer apply. Look up wheel package management. Paradigm shift as critical mass of people choose a way to do things. Sometimes all that is necessary is to transport idea from one industry to another. Founder and co-developer of a number of popular Python projects, among them PyPy, py.test, tox and execnet. 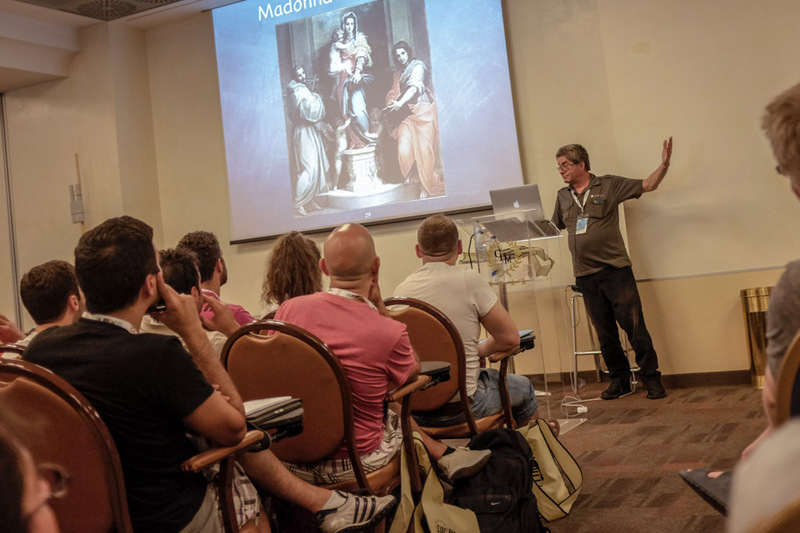 Regularly gives talks at conferences as well as open courses and in-house trainings on testing topics. His interests also include P2P computing, metaprogramming and politics. A video of this presentation is now online. How much is Google, Facebook, etc. responsible for aiding Spying Cartel? IT people are like bishops. We know how programming works and relates to society. We have a responsibility to make choices that cause no harm. It’s all about communication between devices, mediated by technology. Communication mediated by few companies. Companies can be compelled to co-operate with government. Weak or no end-to-end encryption == BIG PROBLEM. P2P code needs to be FOSS & run on OWN device. Active FOSS (free, open source software) Python project. Communication is about more than only file storage. New promising WC3 standard: Web RTC - browser-to-browser data streaming, real-time communications. http://ozan.io/p/ : Peer-to-peer networking with browsers. http://sharefest.me : Browser-based P2P filesharing using WebRTC. http://vole.cc : P2P social networking project. http://nightweb.net : P2P social networking project with bittorrent. WebCrypto API - native encryption in browser. Project SPAN: ad-hoc android mesh networks. http://Freifunk.net = free WLAN network. Bittorrent Sync - Automatically sync files via secure, distributed technology. Great free, open source alternative to Dropbox. Bittorrent: written in Python, 10% of total internet traffic. Given enough time, looking at history, countries are in danger of having criminals in charge. It’s about Convenience. Some choose inconvenience (Edward Snowden). ¿Q: Is there hope for a world without nation states? Yes. FOSS is transnational. WebRTC standard - nations had no say. Nations not so important in internet world. How do we do mediation? It would make much more sense to have government communications open and transparent as they have nothing to hide, right? Answer to the “If you have nothing to hide, you shouldn’t worry about surveillance” argument: The damage from a totalitarian society is much higher than from terrorists. Alex Martelli in Florence in 2013. Author of Python in a Nutshell and the first 2 editions of the Python Cookbook. For the last 8+ years has been working (as ‘uber’ tech lead and senior staff engineer) for Google in Mountain View, California. “Worse is Better” —Unix, ‘New Jersey’ approach. Most important consideration is design. Slightly better simple than correct. Can be sacrificed to any of above 3. MUST be, if simplicity is threatened. Perfection == Big Design Up Front. The world is changing all the time. Your perfection is a memory of the past. Use ‘Perfect’ as Verb, rather than adjective. Light-weight agile process and its steps. Revision control, code reviews, testing. Okay to incur technical debt, WITH CARE. As long as you can recover, it’s okay. Is reputational damage to yourself recoverable? Depends, but most usually, yes. Especially courteous, speedy response to issues that get reported = service. Getting it right the 2nd time is usually OK. Hiring: you have to pick the best one who will have you. No one cares about perfect lines - Am I moving something in people’s hearts? Hynek Schlawack is an infrastructure and software engineer from Berlin, Germany, PSF fellow and contributor to a wide variety of open source projects. How a German web hosting company and domain registrar deploys numerous Python applications on UNIX-based systems. Simple is not Easy. Put effort into making your deployments simple. Edsger W. Dijkstra: > Simplicity is prerequisite for reliability. Donald Knuth: > It is important to find simple solutions instead of stopping as soon as a first solution is found. Application is tied to server OS version. Upgrading servers == updating your app. Packaging is not hard. Use fpm. Automate - use configuration management, test in staging. Security - Be paranoid, iptables, /bin/false, ssl, fail2ban, file sockets, revoke all, etc. Restart - upstart, systemd, supervisord, circus, etc. Log - log to stderr, redirect stderr syslog, use OS tools. Deploy, using Apache is fine if conscious decision is made to use it, but uWSGI or Gunicorn + Nginx provides better separation of concerns and is simple to set up and has some awesome benefits (uWSGI emperor mode). Monitor - nagios, pingdom, etc. Measure - graphite, statsd, etc. Lynn Root is a software engineer at Red Hat on the Identity Management team. She is the founder and leader of PyLadies San Francisco, an international mentorship group for women and friends in the Python community. Advanced e-learning, or introducing programming to new coders. Software development moves fast. How to teach programming? Learn to tread water by playing water polo, not by someone dictating how to move arms & legs. Knowledge is actively constructed by the student. Build things that are used in the real world. Daniel Greenfeld is a software developer and co-author of Two Scoops of Django. Audrey Roy is a software developer and designer and co-author of Two Scoops of Django. Hands-on Django workshop. Built a real, working site from the ground up, using Django 1.6 and Python 2.7⁄3.3. Covered Python and Django setup, project creation, app creation, models, the Django admin UI, views, migrations with South, user image uploads, new user registration, basic forms, and basic internationalization. Patrick Büchler is a Software Developer. Car analogy - people who go to BMW will get different quality than Fiat. Same with software, but not appreciated. Right mix of people important. Pointless to have lots of all-stars because they will all have their own idea of how it should be done. How to implement Python? How to manage risks? If you take a decision, implement it quickly. People learn only with real challenges. Innovation not the same as research. As entrepreneur you must innovate, not research. Can’t afford to spend much money on not-financed activities. Project should not be critical. Not be too small (at least 1 man-year). Should not contain complex technical challenges. Should not contain complex business logic. Should not be in a risky domain. Should be assigned to a specific team, without people who are against the project, with mix of first-movers and conservatives. Primary goal should still be to finish the project with a profit. Python is not Java!! def my_function() != public int myFunction() Do code reviews! Especially when devs used Java or C# before. Developers coming from VB have less projects. Allow refactoring: give your team the time to make their first project good. Enforce refactoring: force your team to make the first project good. Be patient: do not forget that it is new for most developers. Be strict: you decided to risk implementing the project in a new language, stick to your decision. Python is agile, use this: with python debug cycle is very quick, use this i.e. in sprint review. Don’t interfere too much: let your colleagues work on their own, so they learn! Surrounding systems enforce specific tech. Base systems used enforce particular tech i.e. Oracle. IT Departments often proficient on one platform only. Contracts with vendors or suppliers enforce given tech. High investments required to change. IT Departments often reluctant to change their systems even when outdated or try something new (consider the type of personality who becomes sys admin). Management hear saying (we MUST have SharePoint because it will solve all our problems as my friend told me on golf course). Internal Politics (we decided that XYZ is the best architecture, we cannot change now). Quasi-religious beliefs or important decision makers or influential people (there is no better sport than to provoke a dev by criticizing his language of choice). Very fast development cycle - you can even debug and change the code onsite during the sprint review!! Completely open source - not owned by Oracle unlike Java, MySQL, etc. Fear of Vendor Lockin: most business people know .NET and Java and believe all else a niche. Fear of Open Source: understandable, many dead open source projects. Lend helping hand to sysadmins: maybe he used SQL Server and IIS since 199x! Suddenly it’s PostgreSQL and web2py. Help him and he will be a grateful promoter of your technology. Most problems not technical! Remind your customer and your team about this. If you run into performance issues, do code review, use C and bind to python, etc.